Point McKay Dental is pleased to offer NW Calgary Invisalign Invisible Braces to correct misaligned and crooked teeth. It is the virtually invisible way to straighten your teeth without braces. Invisalign Braces are a clear alternative to conventional braces for patients as young as 13 years old and for those young at heart. 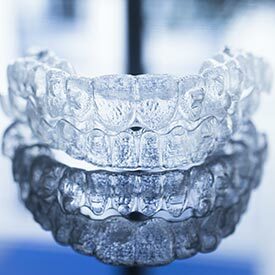 Conventional orthodontic methods straighten your teeth using appliances and wire braces — and both have a reputation for being uncomfortable and unattractive. Traditional wire braces are hard to clean because food becomes trapped in the brackets and wires. Plaque also accumulates around the brackets and can lead to irreversible discoloration and tooth decay. The Invisalign Braces system uses a series of clear, removable aligners to gradually move your teeth into alignment. Invisalign makes to easy for you to brush and floss your teeth throughout your treatment and our patients love eating all of their favourite foods during treatment thanks to the removable aligners. Too much space in between the teeth can often be treated using Invisalign. Spacing between teeth not only looks unattractive, but can lead to concerns with the gum tissue such as periodontal pockets that can accumulate plaque and a general increased risk of periodontal disease. Dr. Paul Hul is a Certified Invisalign Provider and has extensive experience with Invisalign treatment for both adults and teens. If you would like to learn more about NW Calgary Invisalign Invisible Braces, book your consultation appointment with Dr. Paul Hul today! Call us at (403) 283-7829 to book your Invisalign Invisible Braces Consultation with us today!